- Separate the whites from the yolks. We'll only be using the whites for this recipe. - Whip the egg whites until stiff. - Continue whipping while slowly adding the sugar (about three spoons per egg white). 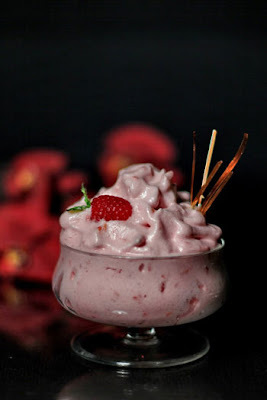 - Add the raspberries, and continue whipping. The foam should turn slightly pink as a result. - Chill and serve. Best if prepared a couple of hours before serving. - Present in a nice bowl..
- For an extra effect, brown some sugar in a pot, then spread in straight lines on aluminum foil. When cold, place the caramelized sticks in the foam.